Drop our team of Myeloma Information Specialists an email and get answers to all your myeloma related questions. Perfect for those who prefer typing to talking about myeloma, our Ask the Nurse email service is another strand of our Infoline service for anyone affected by myeloma. Our Myeloma Information Specialists aim to answer all emails sent to Ask the Nurse within a maximum of three working days, and the vast majority are answered on the same day. This service has been accredited by The Helplines Partnership since 2004. It’s important to remember that this service gives you general guidance and should not be considered as medical or clinical advice, or used as a substitute for personalised or specific advice from a qualified healthcare professional. This also applies to any legal or financial matters. Have you / the patient had any treatment? Are you/the patient currently in remission/plateau? Have you / the patient had any complications? What other complications have you / the patient had? Are you / the patient on a clinical trial? What trial are you on? 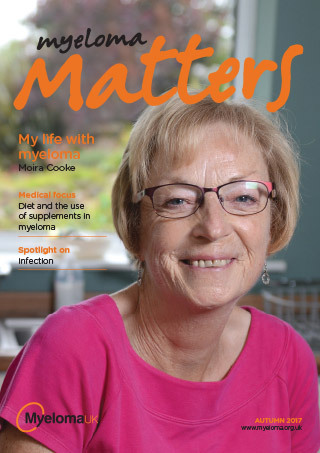 Free quarterly myeloma specific magazine, sign up for more details. 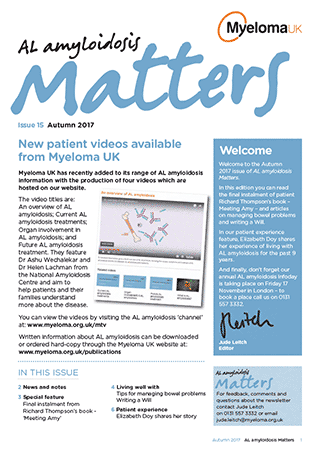 Free twice yearly AL amyloidosis specific newsletter, sign up for more details.